"Wear your clothes, don't let your clothes wear you." 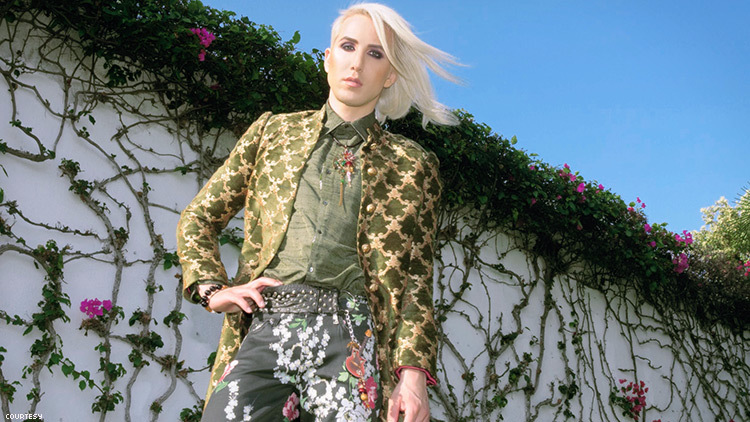 Ricky Rebel manifests the spirit of fashion and queer pride with his new visual “Life Is A Runaway”. The video, which features the voice of Drag Race alumnus Vivacious, shows Ricky walking the streets of NYC during the city's annual LGBTQ Pride parade. “Life Is A Runway” is a powerful single that encourages anyone who’s watching to be confident with who and what they are. In preparation for the video premiere, OUT caught up with Ricky to discuss the video and his queer artistry. OUT: What inspired your video? Ricky Rebel: “Life Is a Runway” is a song about having the courage to be yourself and expressing that to the world. I wanted at least one track on my album — The New Alpha — dedicated to fashion because it’s a big part of my life. I believe that clothes are magical. When styled correctly they can transform the way that you feel about yourself. I even started my own necklace and accessories line called Ricky Rebel Renaissance by Astrophytum. When I rock the pieces on the red carpet they complete the look and make me feel like a work of art. I’d like to teach my fans how to “wear your clothes, don’t let your clothes wear you.” Too often I see people playing it safe when it comes to their own style and expression. When I got asked to perform at New York Pride, I felt like it was the perfect opportunity to film the video. New York has this powerful energy and freedom in the air. The pride festival itself was such a loving and moving experience. I cried at one point as we were filming with all of the thousands that were there. I was taken by the power of the community. All we’ve ever wanted was to feel loved and accepted for who we are. In the video, I strut my looks in normal everyday settings in New York: the subway, Times Square, etc. I took every opportunity I could to perform and make New York my runway. My goal was to free people and make them step out of their comfort zones, laugh, dance, and have some fun. Every now and then a beautiful New Yorker would step into the limelight and strut their stuff. Their freedom was my freedom. It was a cathartic experience. How does your queer identity intersect with your music/artistry? I do not consider myself to be queer, non-binary, gender fluid, or transsexual. I’m an artist and a man who happens to love fashion and makeup. Those things have nothing to do with my gender or my sexuality. My mission is to teach people that at the end of the day, if you’re a man and you feel like putting on a dress and high heels or makeup [that] doesn’t make you any less of a man. That’s The New Alpha.